ages scramble for colored eggs filled with candy and prize tickets at the Easter egg hunt at MediLodge of Hillman. Did you know that by purchasing a one year subscription to the Montmorency County Tribune you save $22 off the newsstand price? Purchase a two year subscription and save $54! Not only will you have more money in your pocket, but the newspaper will be delivered to your mailing address each and every week. Our subscription copies are mailed out on Tuesday. For more information, or to purchase a subscription online CLICK HERE. 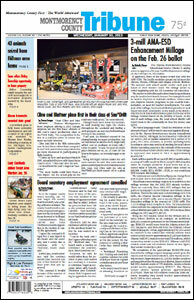 sample issue The Montmorency County Tribune is available in a digital format to our subscribers. This Digital Edition of the Tribune is available each week by Wednesday. It provides a convenient way for out of town readers to catch up on the news from Montmorency County without waiting for mail delivery. It is also great for readers in the armed forces and others who live overseas, as well as those who travel south for the winter. The Digital Edition can be purchased for $20 per year. Visit our subscribe page to sign up for the Digital Edition of the Tribune. If you plan to be away from home for any extended period of time and want to receive your Montmorency County Tribune at your new location, please call us at 989-785-4214 to have your mailing address changed. When you are ready to return home, just let us know and we will change your address back to your home address. Please do this even if you have contacted the postal service to forward your mail. The postal service only forwards second class mail (which a newspaper is considered to be) for approximately 60 days, than they no longer will do so. This means you will not receive your newspaper. If you do not want to receive your newspaper while you are out of town, you may call our office and put your subscription on hold. This will hold your delivery and extend your subscription. When you are ready to return, let us know and we will start sending it to you again. Please note: If you have the online digital subscription that you use while your mailed newspaper is on hold, your subscription will not be extended, as you are still receiving access to the newspaper. 8:30 a.m. til 4:30 p.m. 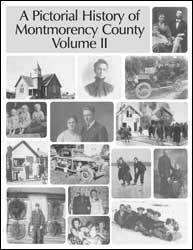 Enjoy a vast collection of photos from Montmorency County’s past in this 161 page book! 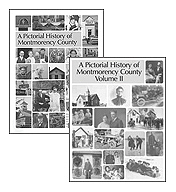 Featuring photos from the early lumbering era up to the late 1960’s, as well as a timeline of Montmorency County. Many of these photo’s have never been seen before and have been acquired from private family collections. To order by phone, call the Tribune at 989-785-4214, or stop by and pick up a copy. You can also order a copy of Volume II to be shipped to you online by clicking the button below. SPECIAL DEAL: SAVE! Get Volume I and Volume II for only $47.70 (including tax) plus $14.00 for priority shipping. Click below to order both copies! Monday - Friday: 8:30 a.m. til 4:30 p.m.